Let’s set the record straight: Millennials want to own a home. The myth that this generation of twenty-and-thirty-somethings is another group of aimless malcontents drifting around without steady addresses has been dispelled long ago. Millennials have proven themselves to be career-driven, family-forming and even real estate-loving, if only they could afford it. Since its inception in Spring 2016, ValueInsured’s quarterly Modern Homebuyer Survey has reported shifts in homebuyer attitudes and confidence; however, one thing has remained constant: Millennials’ strong desire to own home, currently at 77%. At the same time, Millennial homeownership is now at the lowest level – at 35.3% – since the U.S. Census began tracking homeownership by age groups in 1982. While Millennials enjoy strong employment in this robust economy, many are not saving enough of their paychecks for a home. Today, Millennial homeowner hopefuls are paying for $5 coffees (sometimes three of these daily) and $900 cell phones. According to a recent study, 53% of Millennials spent recently on an Uber or taxi ride, and 73% on a music, sporting or other live entertainment event. 79% spent to dine at a hot restaurant in town. Compared to the last generation, today’s young homebuyers have more competing for their disposable income, and don’t forget about college debt and higher rents. 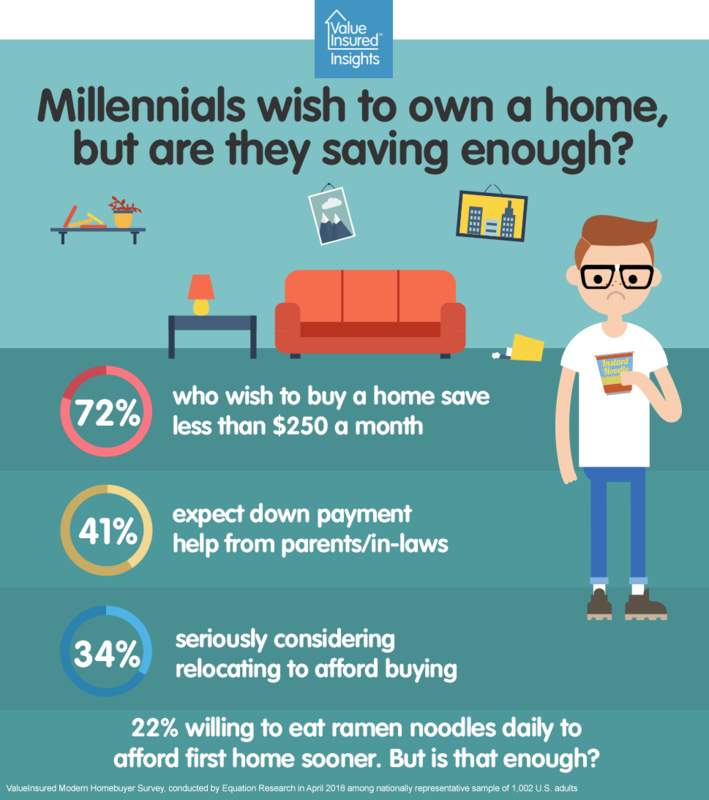 It is not surprising that according to the latest Q2 ValueInsured Survey, 72% of all millennials who wish to buy a home save less than $250 a month. In Q4 2017, our nation’s median home down payment was $18,000; however, this number includes rural area homes where prices are on average lower, and where millennials are less likely to be looking to buy a home. So, it will likely take more than six years for most millennials to save for a down payment. Perhaps knowing that their less-than-$250 savings per month will not be enough, 41% in ValueInsured’s survey expect to count on down payment help from parents and in-laws (or are they not saving enough because they know they will receive parental help?). 34% report to be seriously considering a move to a less expensive market in order to buy a home sooner. Despite reports above of prevalent spending on live entertainment events and dining out, 28% say they are willing to give up cable, and 22% say they are willing to eat cheap ramen noodles daily in order to afford buying a home sooner. In addition to effects on migration patterns and dietary habits, millennials’ inability to save enough to realize their dream of homeownership may also have effects on our political landscape. 22% surveyed believe more politicians will find they need to promise and deliver on affordable housing in order to win future elections. The next generation of homebuyers has a monumental challenge and they need a solution. Organizations, policymakers and innovators that can help millennials solve this problem, save enough to buy a home sooner, and to help them preserve those savings will be more likely to stay competitive in politics, business and beyond.